Vincent’s Form SS-5 (2) led to even my exciting findings. 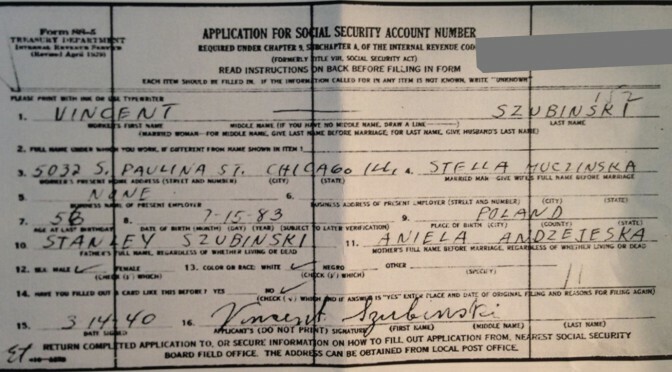 Because Stanley Szubinski and Aniela Andrejeska were listed as his parents I was able to finally make a connection to records on another site. The Poznan Project (3) is transcribing “the 19th century marriage records from the historic Greater Poland (then Prussian Province of Poznan) into a searchable online database.” A search for Stanley Szubinski and Aniela Andrejeska found a 5/1861 entry for Kawnice parish west of Konin with Antoni and Antonina Putrzak listed as Stanislaw Szubinski’s parents and Andrzej and Agnieszka Grabowska listed as Aniela Andrejeska parents. With one form I was able to make other connections and move two more generations forward. I also have a parish to focus my searches instead of a larger region. (1) Peter Anthony Smasz, SS no. 345-01-3852, 26 Nov 1936, Application for the Account Number (Form SS-5), Social Security Administration, Baltimore, Maryland. (2) Vincent Szubinski, SS no. 340-14-1621, 14 Mar 1940, Application for the Account Number (Form SS-5), Social Security Administration, Baltimore, Maryland. (3) Lukasz Bielecki and Maciej Glowiak. “Poznan Project: Poznan Region Marriage Indexing Project for 1800-1899′ online database (http://poznan-project.psnc.pl: accessed 2 Aug 2015), entry for Stanislaw Szubinski and Aniela Andrzewska, 1861.